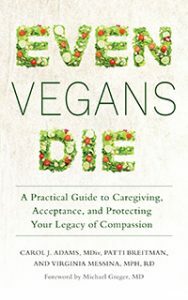 Ginny Messina, MPH, RD has written ten books for vegans including Vegan for Life, Vegan for Her, and most recently Even Vegans Die. She writes and speaks about vegan nutrition, preventing ex-vegans, and the importance of body positivity in the vegan community. 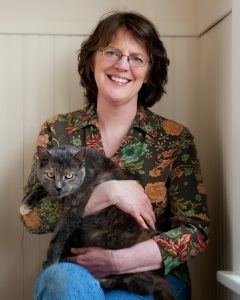 She is co-author of the first vegetarian textbook for health professionals, The Dietitian’s Guide to Vegetarian Diets, and publishes articles on plant-based nutrition and soy nutrition in the medical literature. Ginny’s latest book, Even Vegans Die, co-authored with Carol J. Adams and Patti Breitman, is an important addition to the animal rights literature. I cannot recommend this book enough. Ginny was kind enough to agree to an interview to discuss the book. What was the motivation behind writing the book? How did such an A-list team of authors get assembled? Carol, Patti and I go way back. Patti was my literary agent for my first book published in 1994. And I provided content for one of Carol’s books shortly after that. More recently, we collaborated on our book Never Too Late to Go Vegan, which is for vegans over the age of 50. This new book, Even Vegans Die, took us in an entirely new direction, obviously. It came about largely because of worrisome conversations we observed on social media. In particular, we saw that many vegans have unrealistic expectations about the health benefits of a vegan diet, which gives rise to a whole host of problems in the vegan community. For example, it can deter vegans from making appropriate health care decisions for themselves. It also gives rise to shaming when vegans get sick. And we also realized that while planning for the future – such as having a will – is relevant to everyone, there are some especially important considerations for vegans. Basically, we wrote this book because we believe that addressing these issues creates a stronger and more compassionate activist community right now, and it also helps vegans protect their legacies far into the future. A lot of vegans believe that they are immune to getting sick, especially when it comes to heart disease, diabetes, and certain cancers. This is perpetuated by medical doctors and health “experts” in the plant-based medical world, and amplified by an even louder choir in the community saying veganism is a panacea for all health conditions. There is this notion that a plant-based diet is the “perfect” diet. You on the other hand talk about how this sets up veganism to fail. Can you talk to this, and a bit about the credible research behind vegan diets? The evidence in favor of cutting back on animal foods and replacing them with plants is pretty impressive. But that points us toward a wide range of healthful plant-based diets including traditional Japanese and Mediterranean diets and lacto-ovo vegetarian patterns. We don’t have a whole lot of data showing that vegan diets have health advantages over other plant-based patterns. That’s okay, because a vegan diet is at least as healthy as these other diets and it has clear ethical advantages over any other dietary pattern in the world. Many vegans aren’t satisfied with that, though, and want to ascribe curative powers to a vegan diet that just haven’t been seen in the research. Like the idea that a whole foods vegan diet guarantees that you won’t get diabetes or that eating this way can reverse cancer, or produce eternal youthfulness and boundless energy. Promoting these kinds of ideas undermines our credibility so it’s bad for the movement in general. And when people find out that a vegan diet may not actually provide all of the health benefits they expected, they are likely to view veganism as a failed experiment. It’s one reason that many people return to eating animal foods. I’ve covered fat shaming in the community here, here and here. In the book you talk about disease shaming, which is shaming vegans for their illnesses and making them feel alienated from the vegan community. A lot of vegans are afraid to talk about their diseases for fear of veganism looking unhealthy to nonvegans. On the other hand, some vegans are afraid of talking about their health issues for fear of judgments from other vegans, such as you must not be doing it right, eating oil, sugar and salt, etc. Others are told to keep it to themselves or worse to stay away from activism because they make us look bad. Can you talk more about disease shaming? Yes, disease shaming arises out of this false idea that we know exactly how to prevent every single disease – and therefore, if someone gets sick, it’s their own fault. In some ways, it reflects our universal fear of death. We want to believe that we have complete control over our health, and knowing a vegan who has cancer or some other serious disease challenges the whole idea of that control. So we deal with it by deciding that it won’t happen to us because that other person was doing something wrong. That is, they were eating the wrong kind of vegan diet. Their own actions and choices caused their disease. This kind of blaming and shaming people for their illnesses is far too common in the vegan community. When we were writing this book, we spoke with vegans who had all types of chronic diseases and many of them told us how alienated they felt from other activists because of their illness. They felt embarrassed to admit that they were sick or that they were using conventional treatments for their condition. Some of them had experienced outright blame from other vegans and some said that other vegans insisted that they must have “cheated” and eaten meat. Aside from the fact that these kinds of views about who can and can’t get sick are incredibly naïve, they are also extraordinarily unkind. We need to recognize that our knowledge about the causes of disease is imperfect. And that people who are sick – vegan or not –need compassion, not judgment. What does an ethic of care look like and why is it important to the vegan community? An ethic of care derives from feminist theory, and we suggested that a vegan ethic of care is central to animal activism. It involves first and foremost extending care and attention to anyone who is suffering. This includes both the animals for whom we advocate and also for other vegans. An ethic of care also includes activism of any kind – everything from leafletting to adopting rescued animals to creating good vegan food. It also asks us to accept our grief and acknowledge our mourning for animals which can be hard to do in a society that doesn’t value animals’ lives. It’s important to do this, though, because it helps legitimize our response to what happens to animals. Finally, a vegan ethic of care recognizes our interdependency. We need to view ourselves as those who offer care to others – animals and humans – and are also willing to receive care from others. These four components of a vegan ethic of care – attention to the suffering of others, activism, acceptance of grief, and acknowledgement of our interdependency – provide a framework for an effective animal advocacy movement. You have some great advice in the book for when someone you love has a serious illness or is dying. In fact, you have 23 points. Maybe you can pick out the top three, and why they are so important. I think that those 23 points can easily be condensed into three important ones. First, don’t shame or blame the person who is sick. This means, don’t try to figure out why they got sick, maybe pointing out the parts of their diet that weren’t (in your opinion) good choices. Don’t tell them how to get better. Saying “I know someone who cured their cancer with a raw foods diet,” translates to “you’d probably get better if you’d be willing to eat a raw foods diet.” This imposes blame on the person who, on top of having cancer, now has to feel guilty about not doing what you think they should do to cure it. Second, don’t make this about you. When someone is seriously ill they need support and help. It’s not their job to provide you with insights about what it’s like to have a serious or terminal illness. It’s not fair to expect them to reassure you about how they are doing, or to offer you the opportunity for closure by visiting them. They may want you to visit, but that has to be up to them. You are there (or not there, depending on their wishes) to support and care, and the needs and desires of the person who is sick take precedence over your own needs. Finally, offer whatever practical help you can. Sometimes it’s by providing direct help to the person who is sick and sometimes it’s by providing support for those doing direct care. You can bring vegan food for the caregivers, walk the dogs, take animals to the vet, do the grocery shopping, feed the colony of community cats who depend on the person who is sick, or mow the lawn. In a nutshell, when someone is seriously ill, your responsibility is to put that person first, do whatever you can to help, and to take great care to avoid any kind of judgment or opinions about why they got sick. We lost one of our movement’s best and brightest lights when Lisa Shapiro died of cancer. Thank you for including her story. Your chapter on how to cope when you have a terminal illness includes some points that are specific to vegans facing terminal illness. Can you share a few tips? One particular dilemma for a vegan with a serious illness is that most available medications and treatments have been tested on animals. Since vegans take a strong stance against animal testing it might feel hypocritical to make use of those medications and treatments when we need them. But it’s not. Vegans strive to avoid all uses of animals wherever possible. When it comes to diet, clothing and entertainment, it’s nearly always possible to avoid products of animal exploitation because we have so many alternatives. But other areas are trickier. There are times when there is no vegan option and that’s often true in the treatment of serious diseases. It’s perfectly appropriate to take advantage of the only treatment available while also advocating for alternatives to animal testing in the hope that in the future, others will have the choices that you don’t have now. I really enjoyed the chapter on mourning and grief. Grief is such an individual and mysterious experience. I like that you included a section on losing an animal companion, as well as how animals grieve. Losing a companion animal is one of the most difficult experiences we undergo. I think a lot of that is due to the closeness of the bond. Can you share your thoughts? I think one hard thing about this particular grieving process is that our society doesn’t really give us permission to grieve the loss of a companion animal. We’re allowed to be sad, but expected to bounce back pretty quickly because “it’s only an animal.” We live in a society that doesn’t really honor the closeness of that bond. Grief feels that much harder when it’s not recognized. And really, this is sort of an extension of what we experience as animal activists. We are more or less in constant mourning for the suffering and death of animals. In our book, we talked about the fact that we live and work in the midst of huge losses that touch us deeply, but that the rest of the world doesn’t recognize. Losing a companion animal may feel different –it’s a more personal and acute loss – from how we mourn for the suffering of animals in general, but the societal context is the same. Non-vegans love their companion animals, too, of course, but their relationship to animals overall is different from ours. This is one reason why it is so important for us to support each other in the loss of an animal. Send a card, make a contribution in the animal’s memory, bring a vegan mac ‘n cheese casserole – all the things that people do when a human dies. It can help to assuage some of the loneliness involved in grieving for animals. That brings up two key issues that are perhaps different for us compared to non-activists: protecting those companion animals and ensuring that we are leaving money to the organizations we care about. I recently read that 500,000 companion animals end up in shelters each year because they outlive their guardians – presumably no one stepped up to care for them. (We have a PetWill for Freddie.) Can you comment on why wills, trusts, and legacies are so extremely important for adults of any age with animals to care for? Anyone who has ever worked or volunteered in an animal shelter knows how heartbreaking it is when an animal arrives because their guardian has died. It’s awful for the animals of course, and most likely the person who died would be devastated to know that their beloved animal ended up in a shelter. It’s absolutely crucial for anyone with companion animals or who cares for homeless animals to have a will and to include provisions for their animals in that will. This means identifying the person or people who will care for your animals and making sure they have the resources to do so. It’s not at all unusual to do this and there is actually standard legal language to cover the care of companion animals. This is one of many reasons why it’s important for vegans, no matter how much or how little money they may have, to have a will. It’s essential for all adults. What one piece of advice would you like to hammer home to vegans, if they can’t or won’t lay hands on the book? Anyone can get sick and we are all going to die. Our activism is strengthened and enhanced when we acknowledge this and act on it by extending compassion toward other vegans and by making plans to continue our legacy for animals after we die.